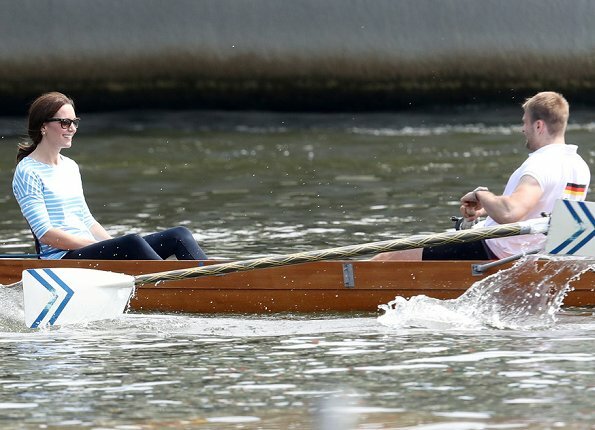 Duchess Catherine of Cambridge participated in a rowing race between the twinned town of Cambridge and Heidelberg and against Prince William, Duke of Cambridge. 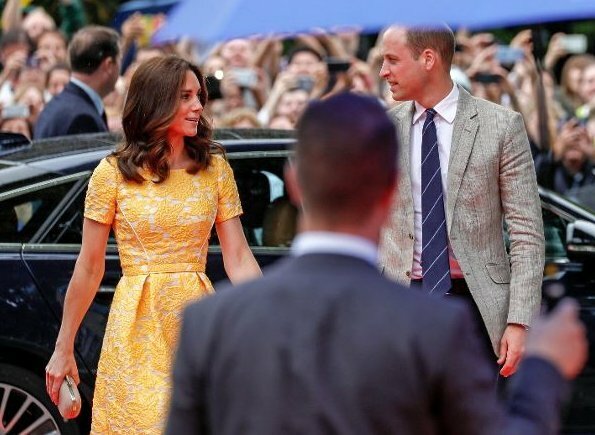 I like the yellow dress - it looks familiar, has she worn it before. Not keen on the wedges but she obviously finds them a comfortable option as she wears them quite a lot. I can't see the earrings because of her hair. I don't care much for the dress - too much of a sofa fabric! But I simple adore the earrings!!! Classic, chic and yet trendy! I wish she would wear her up so we colud see them better!!! I really like his suit! 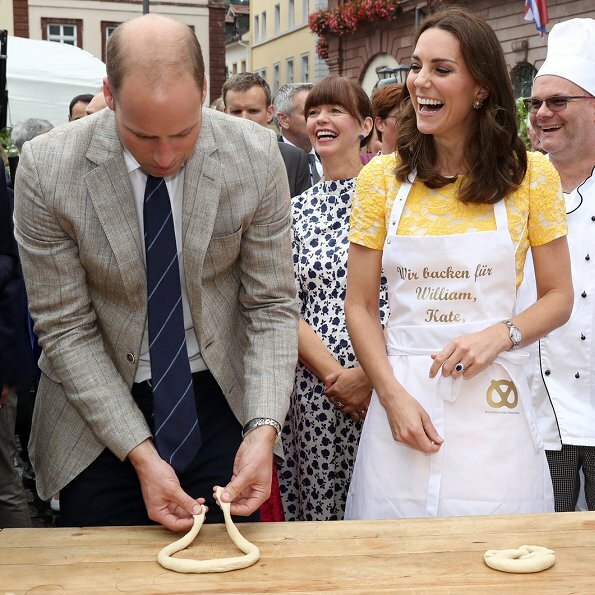 At last the Duchess has a dress made to HER proportions and the waistline sits at her waistline. I know I harp on that all of the time, but she looks so much better in a dress that fits. It is a nice dress, very safe style-wise, and it looks rather warm. The fabrics seem a bit thick, but all-in-all, a good choice for the day. Shoes with wedges are a smart idea for European streets and walkways that are cobble stones. Why risk a twisted ankle? 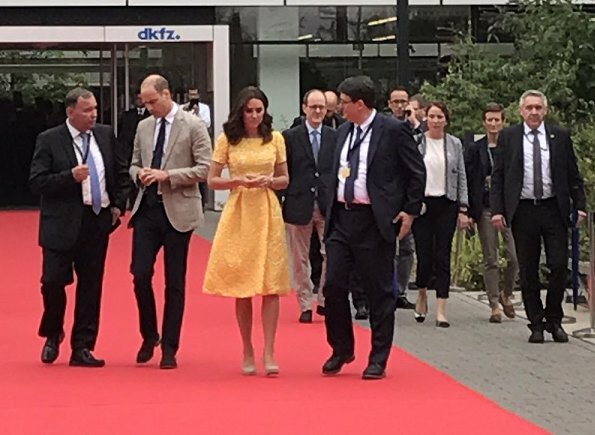 Once again the Duchess pay respect to the country they visited with the yellow (gold) colour dress to compliment the gold in the German flag. This is a beautiful dress with its floral jacquard design, flattering fit and flare shape. 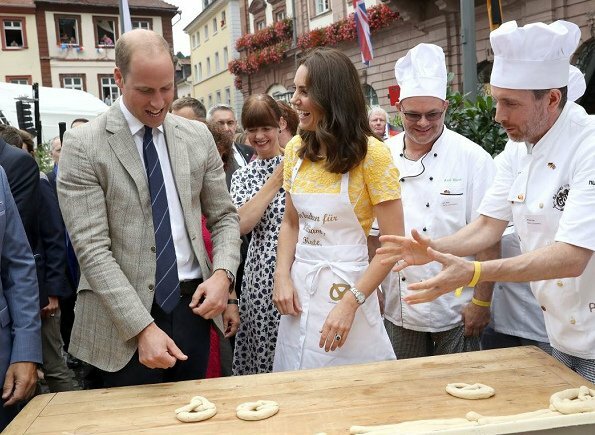 You are the bright star in this most beautiful, scenic city of Heidelberg, Duchess of Cambridge. anmas, that's true! 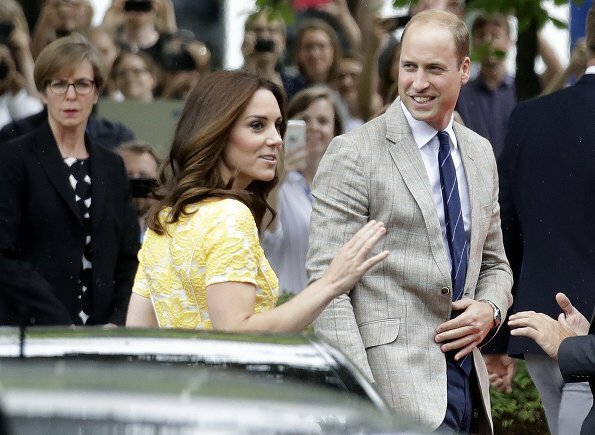 The dress is lovely and a nice colour for the Duchess, but the clutch and the shoes? 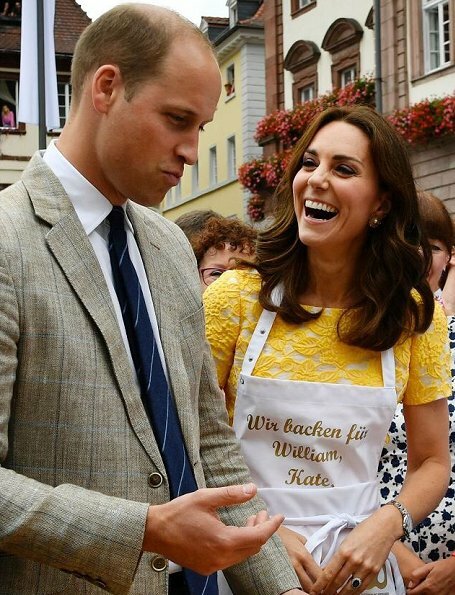 William's outfit is horrible. Plse., get a little advice from King Felipe!! Best pictures, funny and relaxed are those at the sports-event. I fully agree, nice dress, good color for her, I even like the shoes, but never, ever with this dress, same as the clutch, a total disconnect, other than that, she still manages to look lovely. Finally a very nice outfit. Not sure I like this dress. The brocade fabric seems way to heavy for a summer day, as stated above. Great to nod to the host country in the color, but she could have worn her banana dress, which is much more modern for a younger woman. Does anyone know if the wedges are comfortable shoes, I'm not sure! Pretty dress with great fit and colour. Maybe it wasn't such a hot day as I see other women are wearing jackets. I really don't see her posture being so bad in these photos. Wedges are not the most becoming of shoes, but they are perfectly well suited for a stroll through a street market. What I don't understand is carrying a minaudière with a day dress for a visit to a market. A nice natural raffia clutch would have looked much better and appropriate. 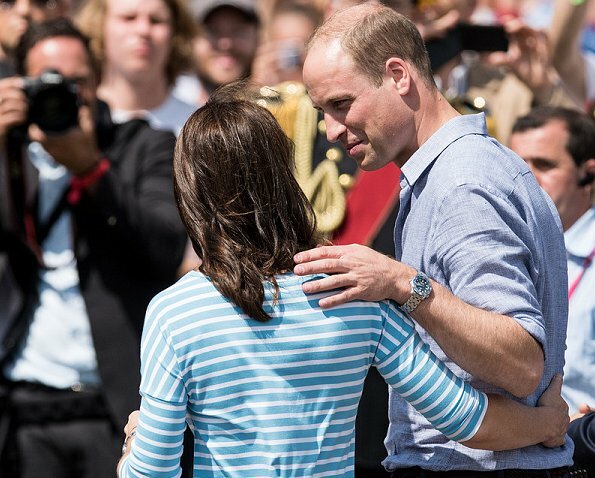 Pity the photos were not published of the interaction between the Duke and Duchess after the race. She looked stunning in the blue and white top. The dress is. It brocade. It is an embroidered voile, very light, summery material. Thank you! Finally someone that knows fabric! I wish we could tell the followers how beautiful the light relects on quality thread. I wanted to mention this myself! Perfect with wedges. Thank you Ms. Electra, for researching her beautiful earrings! Isn't brocade. Sorry for the typo. Such a beautifully designed dress. 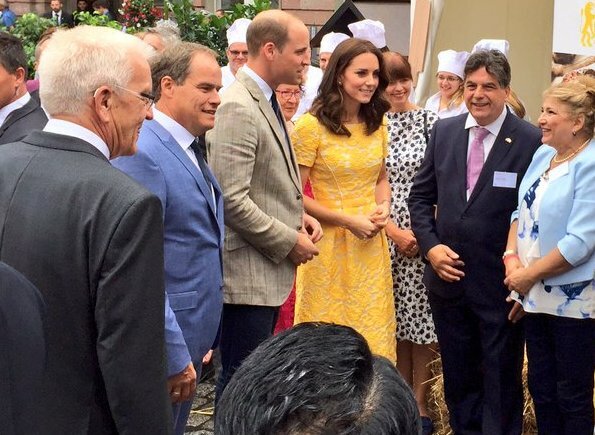 I don't like the fabric, but the style and the length are perfect on Kate. Would love to see this repeated in a different colour/fabric. Patricia ,c'est un très lourd brocart ,si c'était un voile léger la jupe tomberait contre les jambes .ici la jupe tient évasée toute seule . erg genoten van de mooie foto,s!!!! Oh my, I love how this dress fits her!